The Guilford Courthouse Flag, according to tradition, was flown at the Battle of Guilford Courthouse in Greensboro, North Carolina on March 15, 1781. The flag is an unusual one in that its colors are reversed from many American historical flags. It has blue and red stripes with 8-pointed blue stars on a white field. 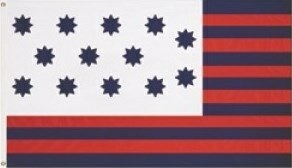 This is the oldest existing American flag with 8-pointed stars. The Guilford Courthouse Flag was first presented to the Grand Masonic Lodge of North Carolina in 1909. It was given to the Lodge as a gift from Major Edward Bullock who said the flag had been given to him in 1854 by his father, Macajah Bullock, who had carried the flag into the Battle of Guilford Courthouse as a member of the Granville County militia. 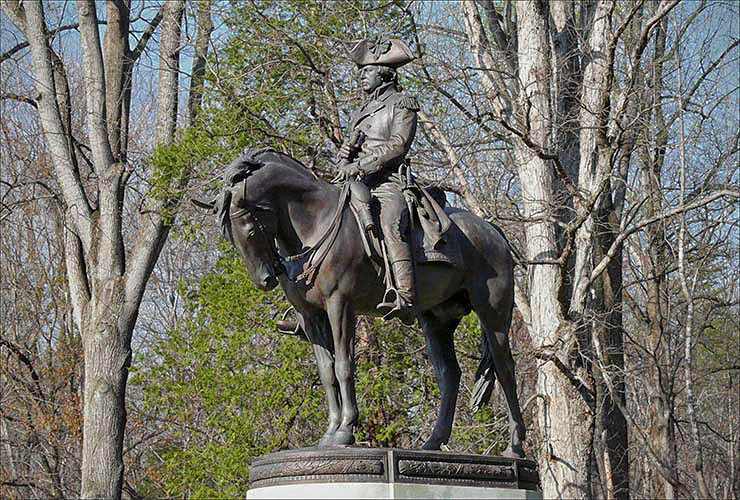 The Battle of Guilford Courthouse was significant because it ended General Charles Cornwallis' inland attempt to take North Carolina and consolidate his wins in the south. Even though the 1900 British soldiers technically defeated General Nathanael Greene's 4,000 American patriots, the British army suffered serious losses, losing nearly 25% of its men who were killed or wounded. The losses forced Cornwallis to retreat to the sea where he eventually surrendered a few months later in October. After Major Bullock's presentation to the Lodge, the flag was associated with the Battle of Guilford Courthouse, but it should be noted that there is no other documentary evidence to support the claim. Because of this lack of corroborating evidence and the fact that there is some evidence on the flag that it may have had up to 15 stars and stripes at one time, historians believe the flag may have a much later date. The Guilford Courthouse Flag is an elongated flag with an extra long canton, the upper left corner portion. The flag is different from most American historical flags because its colors are reversed. It has 13 red and blue stripes and blue 8-pointed stars on the white canton. Many early American flags had 6, 7 or 8 pointed stars. It is a good example of the fact that local militia groups and colonial regiments often had their own regimental flags which they designed themselves. 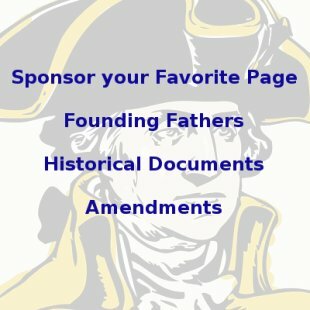 For this reason, there were actually hundreds of Revolutionary War Flags. Only some of them have been passed down to us. The original Guilford Courthouse Flag still exists and is held by the North Carolina Museum of History in Raleigh, North Carolina where it has been since 1914. The flag measures roughly 8 x 3.5 feet long and the stars are 8 inches wide. It is the oldest example of an American Flag with 8-pointed stars still existing. It has been extensively examined by historians who believe the flag may once have had more stars and stripes. The original flag definitely has traces of a 14th stripe at the left bottom corner. In addition to this, the left side of the flag is not finished leading some to speculate that there may have been 2 more stars on the left. This has made some historians believe the flag may have been a 15 star, 15 stripe flag. One theory is that the flag originally had 13 stars and stripes and a 14th stripe was added at the bottom after the admission of Vermont as the 14th state, but before the admission of Kentucky, the 15th state. Another theory is that the flag had 15 stars and stripes all along. All of this has led historians to believe that the Guilford Courthouse Flag is not as old as claimed. If the flag did indeed have at least 14 stripes, the flag would probably be dated no earlier than 1791 when Vermont was added as the 14th state. That can't be stated for certain because some early American flags did have more than 13 stripes, but not very many. Most were 13 star flags representing the 13 colonies. If the flag had 15 stars and stripes, it would date no earlier than 1792 when Kentucky was added. One last factor that leads historians to believe the Guilford Courthouse Flag actually dates much later than the Revolutionary War is that the flag is made of cotton fabric. Cotton was not used in flag making before 1790 as it was not available. It was not widely available until after 1800. Before that, flags were typically made of wool, linen or silk. All of these factors have led some historians to believe the flag may actually date to the War of 1812 and that it was used as a North Carolina regimental flag. In spite of this, most American flag manufacturers still carry the flag today and it is usually thought of as being symbolic of the American Revolution. 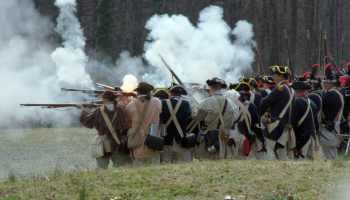 In the popular Mel Gibson movie, The Patriot, the final battle scene is a composite of the Battle of Guilford Courthouse and the Battle of Cowpens. Gibson's character, which is based on Revolutionary War hero Francis Marion, carries a 13 star Betsy Ross Flag in the scene. It would have been more accurate had he been carrying the Guilford Courthouse Flag or the Cowpens Flag. 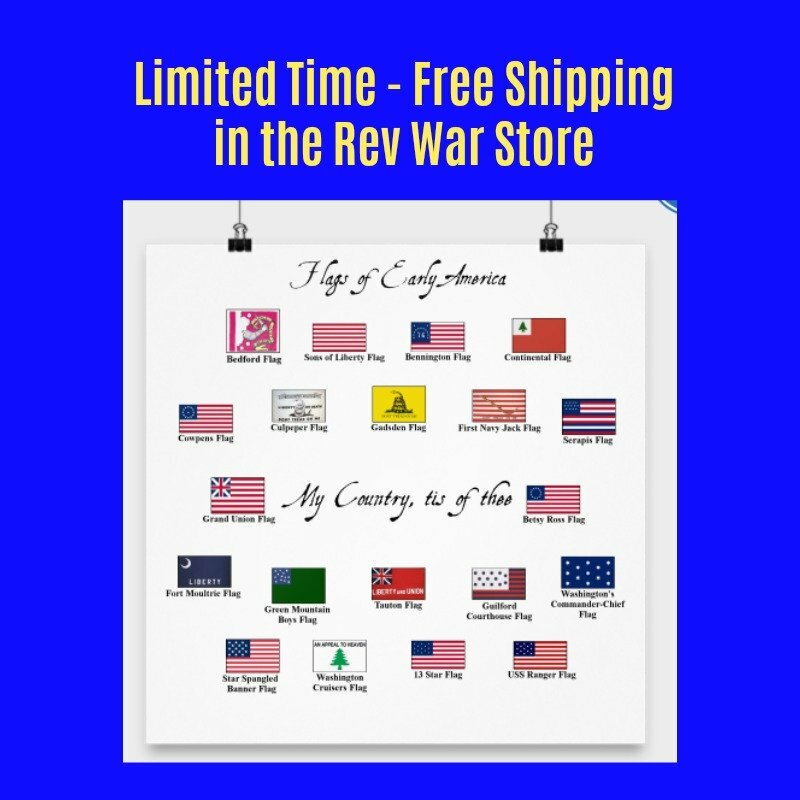 Order your very own Guilford Courthouse Flag here and help support this website with your purchase.